Microsoft Access 2013 is a landing pad for all types of data and external data is no exception. You can import the BDCM file containing an external content type and link to the external data in your Access database on your client computer. The data is read-only, but you can periodically refresh the data. Note: In this case, unlike other Office products, the Business Connectivity Services Client Runtime cache is not used to synchronize with the external list when you access the external data. Important: You must have . Microsoft .NET Framework 4 or higher installed on your client computer. You can download it from Microsoft .NET Framework 4. Only flat data structures are supported, hierarchical data structures are not. The following .Net Types are supported: System.Boolean, System.Char, System.String, System.Int32, System.Int16, System.Double, System.DateTime, System.GUID. Any other .Net Type is converted to text. In Microsoft SharePoint Designer 2013, open the SharePoint site that contains the external content type. On the left pane, under Site Objects, select External Content Types. Select the external content type you want to use. Right-click the selection, and then click Export BDC Model. In the Export BDC model dialog box, enter the name of the model, and click OK. In the File Save As dialog box, browse to a location, and then click Save. Note: To do this task, you must be a farm administrator, an administrator of the Business Data Connectivity service application, and have Edit permission on the model and on all external systems that are contained in the model. 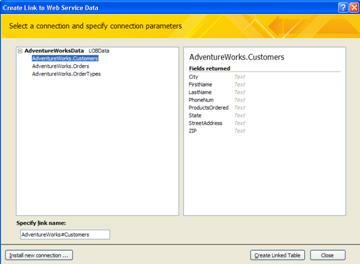 Click in the Name column of the row that corresponds to the Business Data Connectivity service application. On the ribbon, in the View group, click BDC Models. On the BDC Models page, select the model. On the ribbon, in the BDC Models group, click Export. To export localized names for the external content types in a particular locale, click Localized names. To export properties for external content types, click Properties. To export permissions for external content types, click Permissions. To export an implementation-specific proxy that is used to connect to the external system, click Proxies. If you saved a set of resources that can later be exported for use in a particular environment, in the Use Custom Environment Settings field, type the unique name associated with the environment-specific settings to export. The location on your network where the file is located is displayed. In Access 2013, click External Data > Web Service. At the bottom of the Create Link to Web Service Data dialog box, click Install New Connection. In the Select a connection definition file dialog box, browse to and select the BDCM file. If available, under Specify optional parameter values, enter a parameter value for each parameter that you want to use to filter or limit the external data. Select the table that you want to use.